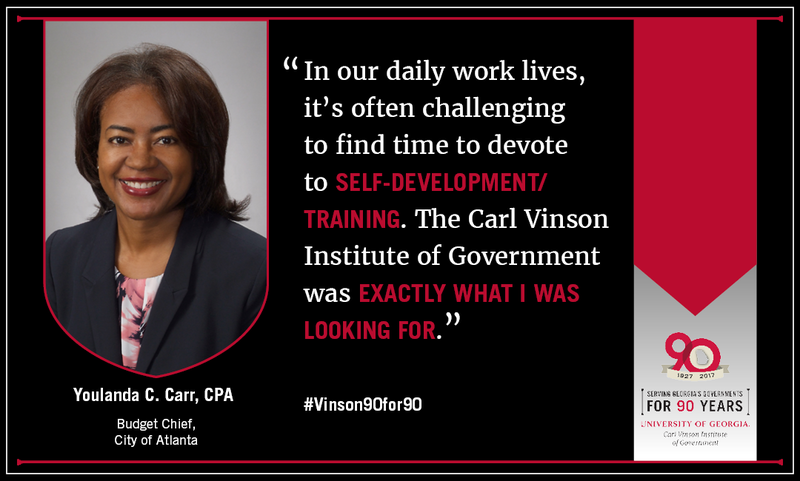 What is the primary focus of your work with the University of Georgia's Carl Vinson Institute of Government? I work on both downtown and environmental planning projects. In terms of downtown planning, I get to listen to stakeholders talk about their communities' needs so that I can synthesize public input, economic, and demographic data into achievable goals for the Renaissance Strategic Visioning and Planning (RSVP) project. In terms of environmental planning, I help Georgia's communities mitigate their flood risks. Last year, I researched simplified emergency flood map creation methodology for dam breaks. This year, I am helping to produce a guide for conducting flood awareness public information campaigns. I have been thoroughly impressed by all of my coworkers' commitment to each other as people and to Georgia as a state. Danny Bivins and Shana Jones have been incredible mentors that have allowed me to grow by giving me countless opportunities to tackle challenging projects, encouraging me to pursue my passions, and providing valuable feedback. Specifically, Danny has taught me the value of big picture thinking in drawing meaningful conclusions from data, and Shana has taught me the importance of conducting thorough, clearly written research. What skills have you gained while working at the Institute of Government and how have they prepared you for your current or future employment? Working at the Institute of Government has taught me the importance of listening to stakeholders while serving the public. At its best, government work is complex because it tries to balance individuals' competing needs and priorities through policy. Working to create downtown strategic plans that envision growth for everyone has taught me the necessity of the public engagement process to balance competing views. I have been able to hone my technical skills by developing text response sorting R scripts, mapping in ArcGIS, and modeling in HEC-RAS. I've grown as a writer and speaker through the opportunities to write and present research papers and presentations. 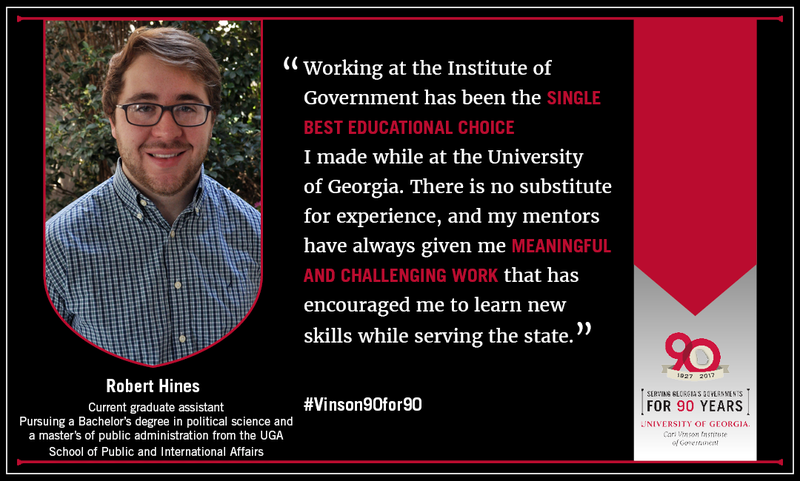 Working at the Institute of Government has been the single best educational choice I made while at the University of Georgia. There is no substitute for experience, and my mentors have always given me meaningful and challenging work that has encouraged me to learn new skills while serving the state. Internships and assistantships at Carl Vinson are always valuable experiences. I have had friends working in private industry who were disappointed that they were not allowed to meaningfully participate on projects. Even as a student worker, I feel like I make a difference at the Institute of Government. 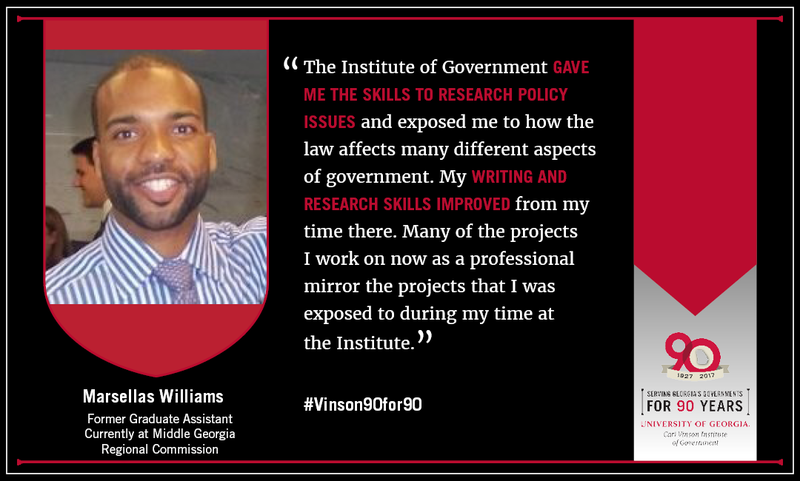 What was the primary focus of your work with the University of Georgia's Carl Vinson Institute of Government? I primarily worked on projects that focused on providing technical assistance and expertise to local governments. These projects included conducting and preparing research on the municipal court selection process for Roswell, Georgia; performing research on the creation of an intergovernmental agreement for the hospital authority for three counties in South Georgia; and editing the code of ordinances for McRae and Helena, Georgia. For me, I wanted to use my law degree to work in public service. It was great working with some of the faculty who were using their law degrees in a non-traditional way. Ted Baggett, who was my supervisor, was a great resource, and he is someone that I continue to seek advice from since graduating from law school. Kris Sikes and John O'Looney were great to work with as well. I truly enjoyed the faculty that I got to work with and was very impressed with their knowledge and passion for public service. The Institute of Government gave me the skills to research policy issues and exposed me to how the law affects many different aspects of government. My writing and research skills improved from my time there. Many of the projects I work on now as a professional mirror the projects that I was exposed to during my time at the Institute. I highly recommend that students intern with the Carl Vinson Institute. If I could do it over again, I would have tried to intern there early during my time in law school. I'm grateful that God blessed me with the opportunity to work there and be exposed to local government and public policy issues. Institute faculty worked diligently to ensure that I had interesting and meaningful work to do. They were always available when I had any questions or hit a research roadblock. Institute faculty offered mentorship and shared experience. Institute faculty and staff cared about my interests and how we could incorporate them into the work and research being conducted. They were very flexible with my graduate school schedule and helped with the work/school balance. The research skills have helped me immensely, and I often point to the research in job interviews. CVIOG has a great reputation, and interviewers immediately are impressed when I say I did graduate research at CVIOG. 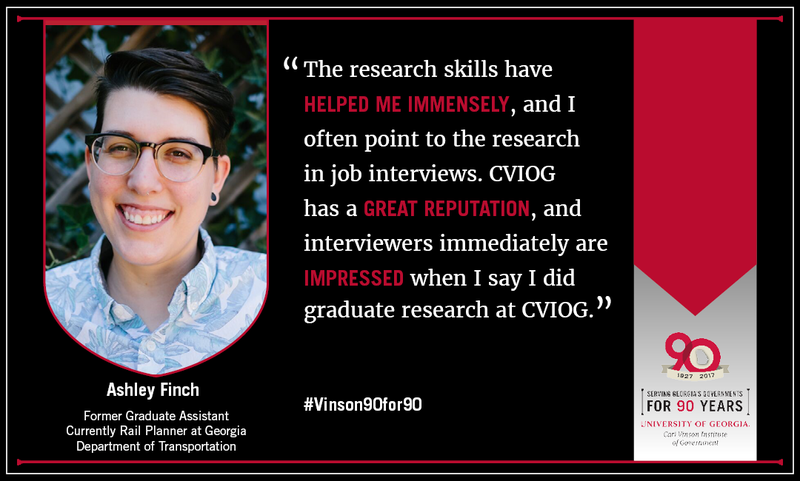 Data analysis and research are integral to my work as a planner, and CVIOG helped me to better develop strong research skills. I also gained experience in meeting with public and private sector stakeholders, which I continue to do in my current work. It helped me to build a better sense of professionalism. I am very grateful for the experiences and relationships I fostered at CVIOG. I am still in touch with the people I worked with at CVIOG and would love the opportunity to work with them again in the future. I even had the pleasure of seeing Danny Bivins and other CVIOG employees present an amazing poster "Chicken Fever" at the American Planning Association 2017 conference (and win!). I feel proud to have worked for an organization that stands out as a leader in government research, planning, and training. 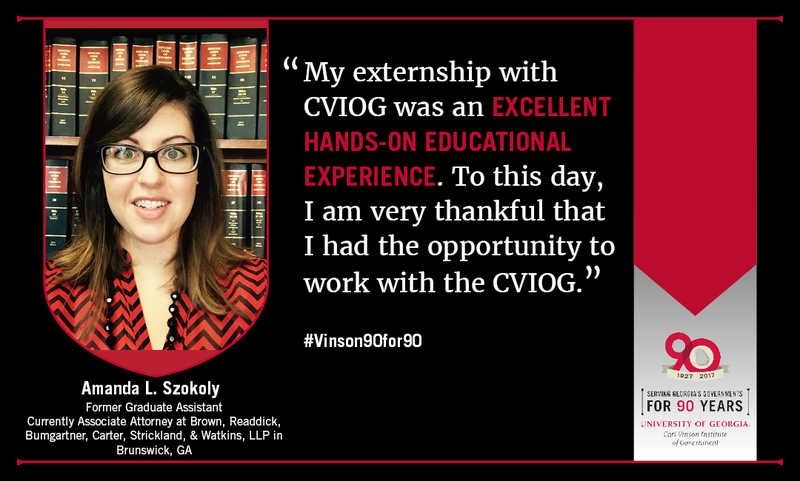 During the course of my externship with CVIOG, I performed legal research and analysis regarding a number of issues faced by local governments across the state. The most memorable project was creating a legal framework for the merging of two cities in Georgia (something for which there was very little precedent). I was also given the opportunity to attend and participate in meetings between local leaders effectuating the merger. It was very cool to see the local leaders implement the framework that I helped to create. Ted Baggett was an excellent supervisor and role model. His passion for local government law coupled with his extensive knowledge of the subject was inspirational. He was also very willing to entertain my questions related to the legal field and the pros and cons of different types of legal work. I gained research skills that are specific to local government representation. These research skills prove useful almost daily in my current position as an attorney representing local counties, boards of commissioners, boards of tax assessors, etc. I also was given the opportunity to present research and analysis to local government clients - something I now do regularly. 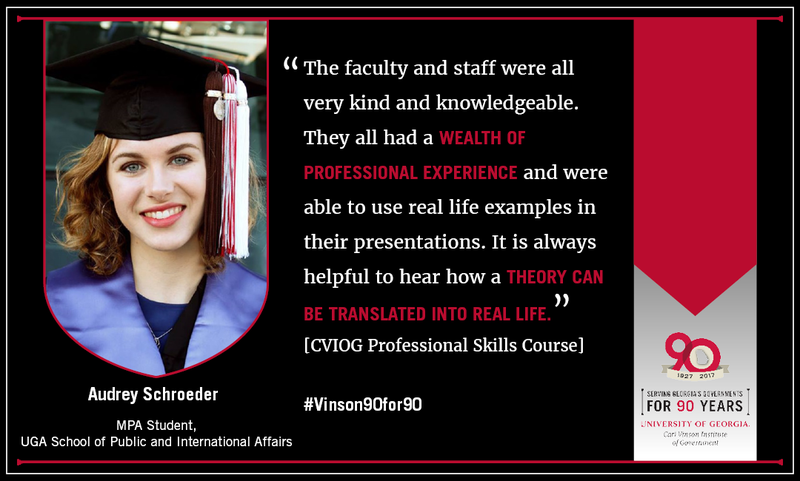 My externship with CVIOG was an excellent hands-on educational experience. In addition to learning the ins and outs of local government law, I was able to see the application of certain laws in real-life scenarios. I was also exposed to peripheral issues that aren't traditionally taught in law school, i.e. budgeting, non-legal consequences of certain actions, etc. To this day, I am very thankful that I had the opportunity to work with the CVIOG. We worked on an attitudinal survey that was sent to female local officials in Georgia. The purpose was to ask what some of the barriers to running for local elected office are for women, considering Georgia has one of the lowest numbers of women in local office in the country. We then compared their responses to the scholarly literature and came up with some potential suggestions for how to address it in the program. Everyone was so welcoming to me and incredibly excited about their jobs and the work that the Institute does! It made such an impression on me to see people so passionate about their work! I was able to manage my own project at the Institute, which has proved helpful in the job opportunities I have been exposed to. There was also an administrative aspect to my time there, and communication as well, both with other individuals and to groups in a professional setting. I also got a glimpse into local government planning. My time at Carl Vinson was integral to the kind of career that I am looking to commit to. I learned so many new skills in an interesting environment that gave me hands-on experience in the public sector. My mentor continues to be so helpful past my graduation from UGA and I am so thankful for the connections I made in my time at the Institute of Government. I was part of the Inaugural Vinson Fellows program in the Fall of 2009. During that time, I assisted two different faculty members with their work. I assisted Catherine Bennett with preparing presentations and materials for local government training and continuing education. Additionally, I assisted Harry Hayes with research regarding city-county consolidations throughout the state. The willingness of the faculty and staff to take time in their busy schedules to mentor an undergraduate student made an impression on me. Both Catherine Bennett and Harry Hayes had open-door policies and not only provided direction with projects but answered many of my questions about starting a career in public service. I learned about leadership specifically in the public sector through the training seminars that Catherine Bennett conducted. Additionally, I developed my data analysis and critical thinking skills through working with Harry Hayes on a city-county consolidation research project. I utilize these various skill sets to solve problems on a daily basis as a state agency CFO. 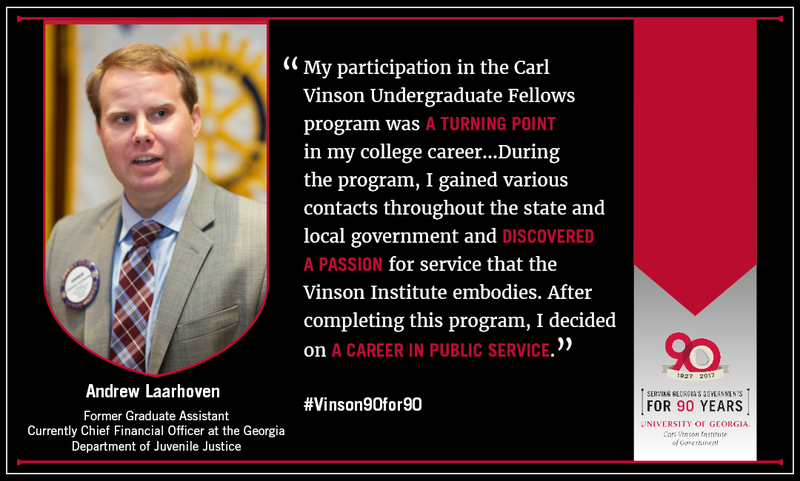 My participation in the Carl Vinson Undergraduate Fellows program was a turning point in my college career. Before I entered the program, I was unsure if the public sector, especially state government, was the best fit for my career. 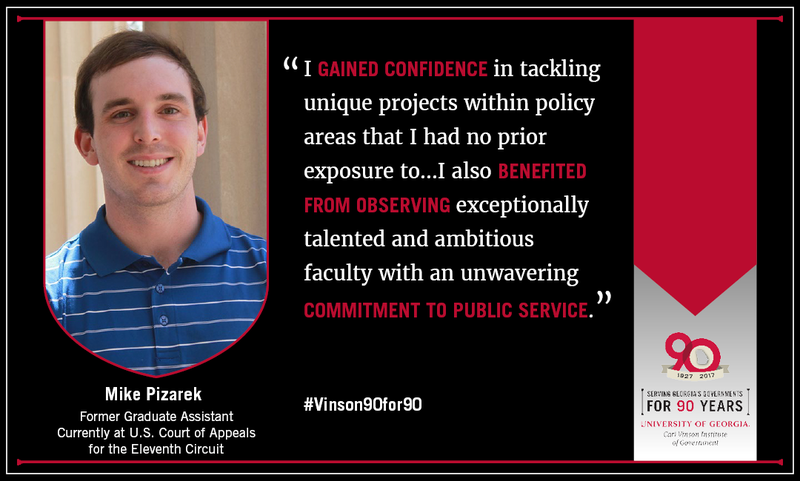 During the program, I gained various contacts throughout the state and local government and discovered a passion for service that the Vinson Institute embodies. After completing this program, I was decided on a career in public service. Why should you take Economic Development courses? I certainly think it's a great networking opportunity. You get to sit with like-minded individuals and understand that some problems or issues or success stories are not just in your own community and also learn from others. I also feel that once you take the training course, you get a wealth of knowledge and packets of information as well to take back that I constantly use in my day-to-day operations. It's been something that I can truly say is a value-add to my craft and career and also back to Newton County to be able to understand different ways to grow our community. Have you learned anything from the classes that you will put into practice? Absolutely! Some of it has really been a refresher, some of it has been new information, some of it has been misconceptions that have been cleared up. You have taken several courses already. Why are you continuing to take classes? It's because of all the great diverse topics - they're all instrumental in what I do. Are you taking more courses? Yes...I should just have two core classes left to take before I get my certification. Why should other Economic Development professionals take courses? I believe it just will be a great opportunity to open their minds to what all is available out there and so that they can deliver that message back to their community. Clarke County School District video tutorials, Clarke County Charter Schools video tutorials, Carl Vinson tutorials - Open Meetings Open Records, Accounting tutorials, and various others.I create tutorials, videos, and do audio narration for educational tutorials. The staff has been very focused, hard working, and for the most part very clear about the objectives of the material I've built for the program. Everyone is very friendly. It's a very nice work environment. There have been various skills that I have learned through the program. Voiceover narration, audio recording, video production, Desire to Learn/ELC, and Articulate Storyline. List the primary areas of training in which you have participated through the Institute. The faculty and staff were all very kind and knowledgeable. They all had a wealth of professional experience and were able to use real life examples in their presentations. It is always helpful to hear how a theory can be translated into real life. What skills have you gained through training facilitated by the Institute of Government and how have they prepared you for your current or future employment? I have been trained for multiple different positions on campus and have never received communication or conflict management training skills even though they are an integral part of every position I've worked. I think that I am now better prepared to interact with my coworkers (including supervisors) than I had been previously. I think it was great that this workshop dealt with skills to advance your career/land a job (like resume building and interview skills) as well as skills to succeed once you get that job. If I had known some of the conflict management skills sooner, I would have approached problems in previous jobs differently! Tell us about the primary areas of training that you received through the Institute. This was my first workshop that I've ever taken through the Institute of Government. First experience was good! Name a few of the topics that you covered in this program. Some of the topics were communication skills, communicating up and communicating down and across an organization. Conflict management skills…how to deal with any sort of interpersonal or other issues that may come up within an organization. Time management was something that we touched on, work-life balance, resume skills, interview skills, basic professional skills -- what to wear, which is something that seems obvious but sometimes not. Those were some of the highlights. 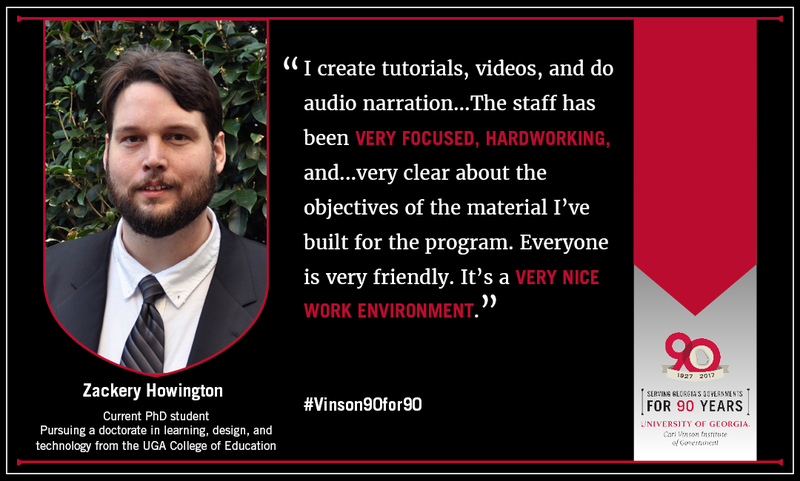 What were some of the positive impressions that you had from the Carl Vinson faculty and staff that taught this workshop? They all had a ton of experience and that was very clear with the way they implemented the sessions. [We] were able to draw on personal, real life experience and apply it to the areas they were teaching us, which was very valuable and also very friendly and approachable. Talk about some skills that you gained that will prepare you for current employment or future employment. What were the biggest takeaways you got from that? The biggest takeaways were definitely communication and conflict management. Because I think that communication, especially when you are talking about differences of power whether it's between a supervisor or someone that's one of your employees…that could be like a little bit of a gray area sometimes. How do you approach communicating with these people in maybe some sensitive situations? And also conflict management was huge for me... it's good to know that there are really clear, rational ways to deal with these situations, like concrete solutions rather than just be mad at the other person. Where do you see yourself…where are you headed from here? I actually have an undergraduate degree in fine art, so I'm trying to use my administrative skills and my love of art to work for a museum or an art school or nonprofit. I interned at an arts nonprofit in North Carolina a couple years ago and it was really, really awesome. I'm trying to combine the two to bring art to people. I think my final thought would be that a lot of these skills that we talked about in this session I think are assumed by employers and so it's never touched on any of these topics in any sort of freshman development course before -- because, again, it's communicating with other people and you assume people can communicate. Sometimes it's really, really hard. So it's great to have some concrete skills to draw on when these kind of things arise in the future. Mara Shaw always showed up in great spirits and provided good mentorship along with a great positive attitude. As a young professional, the interview process is a source of great anxiety. The Institute’s program allowed us to hone our skills and practice them in a low-pressure environment as well as receive feedback that would never [be offered] otherwise. If applicable, have the skills you gained through Institute of Government courses resulted in opportunities for career advancement? 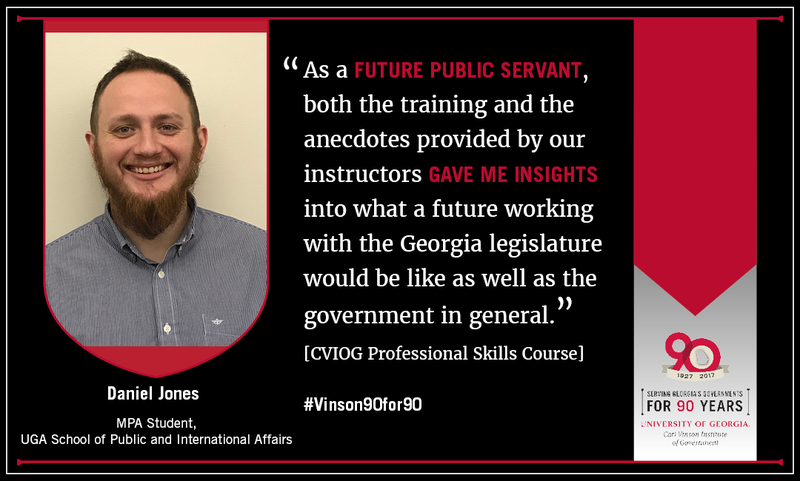 As a future public servant, both the training and the anecdotes provided by our instructors gave me insights into what a future working with the Georgia legislature would be like as well as the government in general. What are other things that stood out to you? The personal anecdotes and stories from the lectures were probably my favorite part of the program. Aside from the two that I mentioned: Mara Shaw being able to talk about her experience working for different departments of different government... and then finally at Carl Vinson. Mr. [Mike] Hourihan always has valuable insights into what the Institute does and I just felt like it gave me greater understanding of how our local government works and what it would be like to work in a local government. And what do you think that you want to do with this? Right now, you're a teaching assistant. Where do you see yourself going? My dream job is at the CDC...I want to work in Atlanta for the CDC doing something with my MPA. I'm specializing in public health administration. Whatever I do, I'm ultimately going to end up working in public service. You talked about the training that you had with conflict resolution -- what was your takeaway? Just emotional detachment from conflict. If you react with emotion, that's what you're doing -- you're reacting not acting. There's no choice being made, just acting out of self-preservation. [Mike Hourihan] gave us a step-by-step kind of process to dealing with non-emotional resolution. What was your best takeaway from the interview skills instruction? I interviewed with Beverly Johnson. She was wonderful -- put me through what felt like a very real interview and she really instilled in me the importance of asking great questions. Mr. Hourihan also pounded the importance of asking different questions and the importance of institutional fit. It's important to interview the place that you are interviewing to make sure that you fit as well as they fit. Tell me about the primary areas of training that you have participated in through this course at the Institute. This soft skills [Professional Skills] course went over everything from personnel management to career development, resume building, conflict management and a lot of other different areas. They kind of all share different variables, so it was very difficult sometimes to kind of separate what you were learning in each particular one, but most of them had corresponding values that you built on throughout each session. 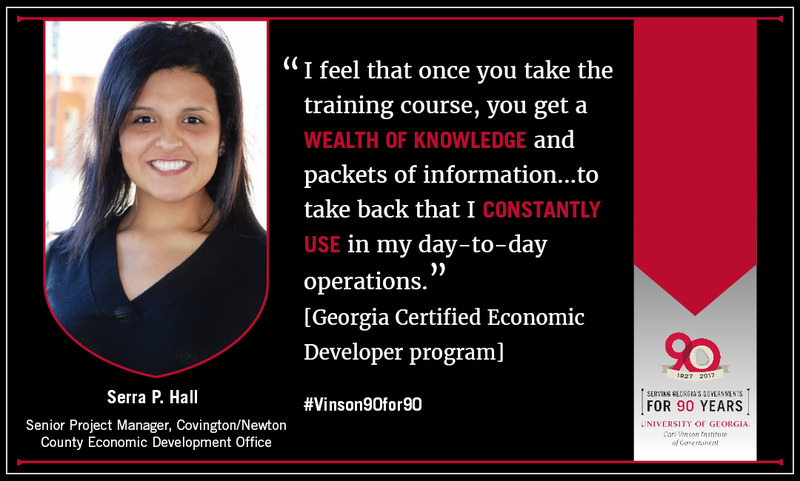 What were some skills that you've gained through the training facilitated by the Institute and how did they prepare you for either your current role with us as the Vinson Fellows Coordinator or future employment? What was your biggest takeaway? It would probably have been conflict management. It was really, really great for me and being able to take that learning experience from a previous job and to transfer to any future employment is extremely invaluable. Where are you headed from here? Where do you see yourself in public service and administration? Hopefully, the goal is to go back into the nonprofit sector. I love higher ed and want to be able to work in a non-profit working with higher education access, especially with marginalized groups or just groups of people who don't necessarily have the access to higher education at any post-secondary training than they would otherwise. I hopefully will be able to go into that…some type of managerial position or even policy just to make sure that those opportunities exist on a legal and a political level for a lot of our underserved communities. I am very impressed by how knowledgeable the staff is, especially as it relates to the State of Georgia financial policies and procedures. 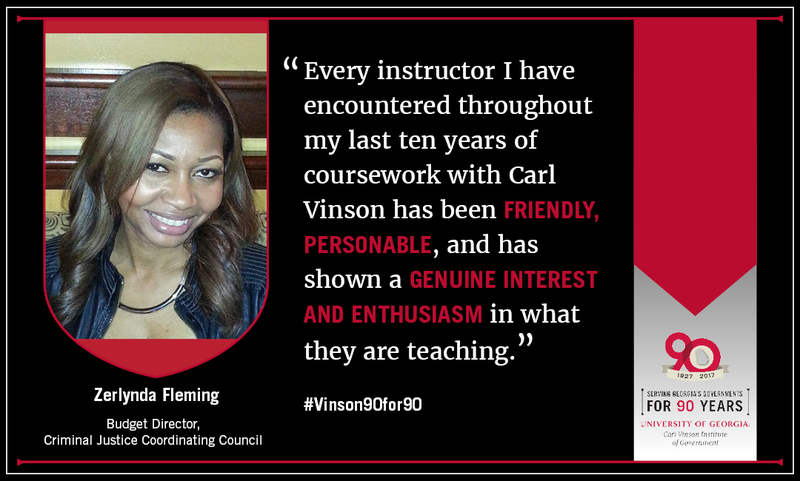 Every instructor I have encountered throughout my last ten years of coursework with Carl Vinson has been friendly, personable, and has shown a genuine interest and enthusiasm in what they are teaching. I am so impressed with the Budget and Financial Management Certification Program. I plan to recommend this series as a requirement for my unit. 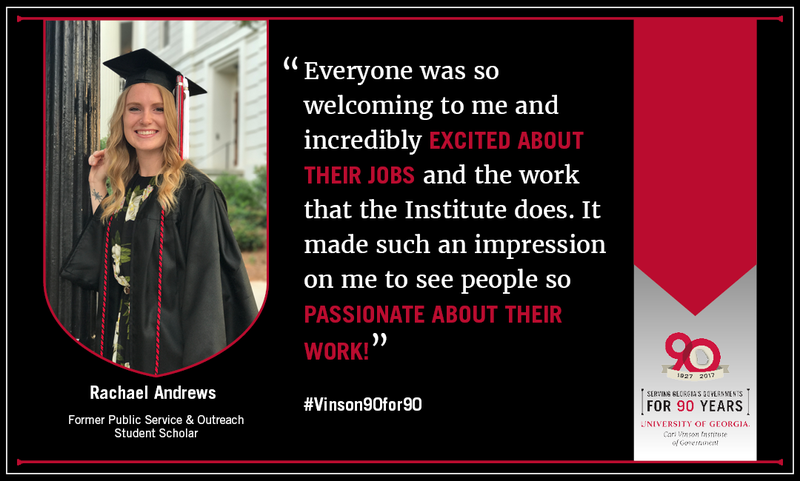 The institute faculty and staff have been very professional and helpful to me from the first time I contacted the institute nine years ago. They have been a great resource and help over the years. In fact, they have always gone above and beyond to help. What were the skills you gained through training facilitated by the Institute of Government and how have they prepared you for your current or future employment? The local government classes were very helpful to me as I began my career as finance director of a small government. Thank you for offering the variety of classes both online and in the classroom. The online classes are very beneficial for most subjects, because they can be taken without having to be out of the office. However, I believe that the advanced governmental accounting classes are more beneficial in the classroom. The City of Atlanta participated in the following courses: Capital Improvement Program, Debt Administration, Introductory Budget, Introductory Governmental Accounting I, Introductory Governmental Accounting II, Purchasing, Treasury Management, and Intermediate Budget. In our daily work lives, it's often challenging to find time to devote to self-development/training. The Carl Vinson Institute of Government was exactly what I was looking for. They brought an amazing and dynamic instructor, John Hulsey, that was extremely knowledgeable and passionate. He tailored the class to our day-to-day operations and made it relatable. I have been able to employ the skills and knowledge that I have learned with great results almost immediately. Again, John Hulsey was very knowledgeable and was able to modify the entire series of courses to our individual government. Having the opportunity to discuss issues openly and honestly and to learn from others was a great experience. I enjoyed the practical elements that could be applied to day-to-day operations. I highly recommend the University of Georgia Carl Vinson Institute. The faculty and staff have always been very polite, warm and welcoming when I attend a course. They are always prepared and make sure to do introductions so that they know which agencies are represented in the class and the area of expertise for each participant. This is a very helpful tool when questions arise and there is a need to elaborate with a real world example. 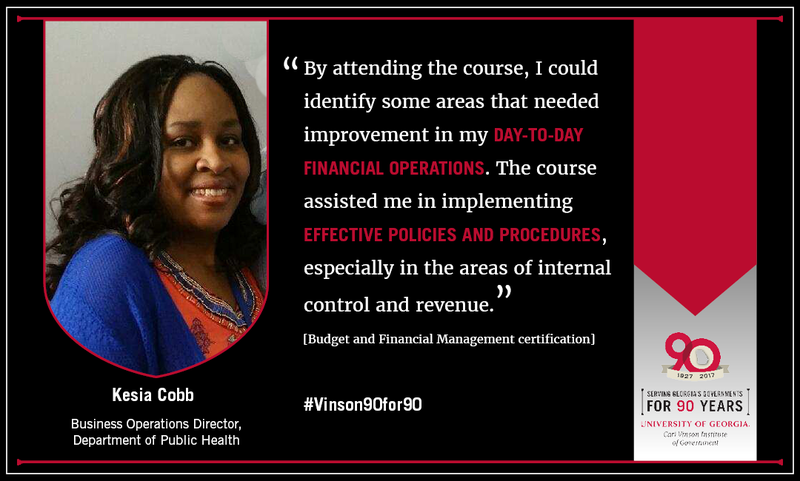 By attending the course, I could identify some areas that needed improvement in my day-to day financial operations. The course assisted me in implementing effective policies and procedures, especially in the areas of internal control and revenue. Feel free to contribute additional comments. Learn, comprehend and apply to your day-to-day operations and be sure to share with others in the organization. David Key was a delightful instructor and facilitator. A lot of the MDP curriculum is reliant on classmate discussion and interaction, and Mr. Key would find ways to ensure there was never a lack of relevant conversation. He was well prepared and had a good feel for when the class was ready to move on from a particular topic or wished to dive deeper. 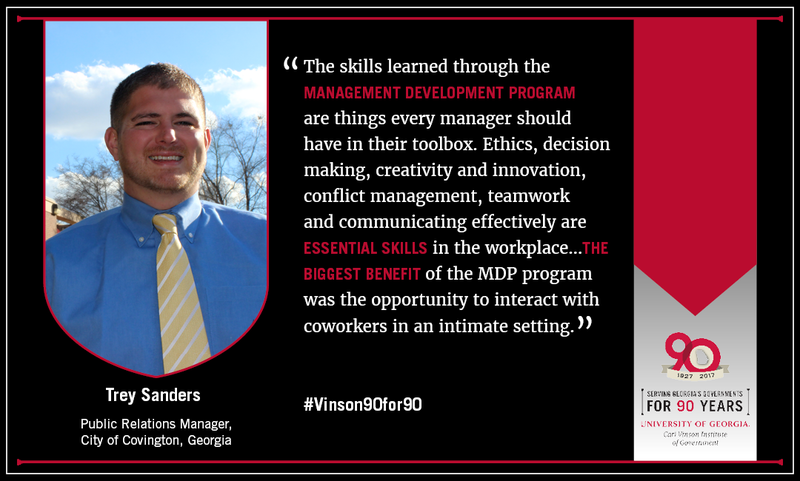 The skills learned through the MDP program are things every manager should have in their toolbox. Ethics, decision making, creativity and innovation, conflict management, teamwork and communicating effectively are essential skills in the workplace and are all covered in detail in the MDP class. I found the biggest benefit of the MDP program was the opportunity to interact with coworkers in an intimate setting. It allowed me the chance to learn about my coworkers on a personal and professional level. I learned their preferences, strengths and weaknesses and I now have a better understanding of who might have some valuable insight when additional help is needed on special projects. I had many unique assignments, which made the graduate assistantship stimulating and fast-paced. My primary responsibility was assisting the associate director for Government Services and Research (now State Services and Decision Support) by conducting research and analysis on diverse topics in preparation of future client or CVIOG team meetings. Clients during my term included the University System of Georgia (USG); Governor’s Office of Student Achievement; Georgia Department of Juvenile Justice; and the Sichuan Administrative Institute of Chengdu. The niche expertise of each faculty member is impressive. On the same hall you had somebody with expertise in applied demographics, another in coastal law, and then somebody focused on land use city planning. Everybody was very eager to share their insights and provide advice to the Institute’s numerous student employees. I gained confidence in tackling unique projects within policy areas that I had no prior exposure to. The utilization of quantitative (Excel pivot tables, macros, data visual tools) and qualitative (survey research, focus group observations) data analysis in various program evaluation studies honed my analytical skill set required in my current job. I also benefited from observing exceptionally talented and ambitious faculty with an unwavering commitment to public service. Above all, my ability to grow professionally under the mentorship of my assistantship supervisor is the most significant takeaway from my short tenure at Carl Vinson. I still consider my assistantship supervisor a mentor, friend and professional resource. 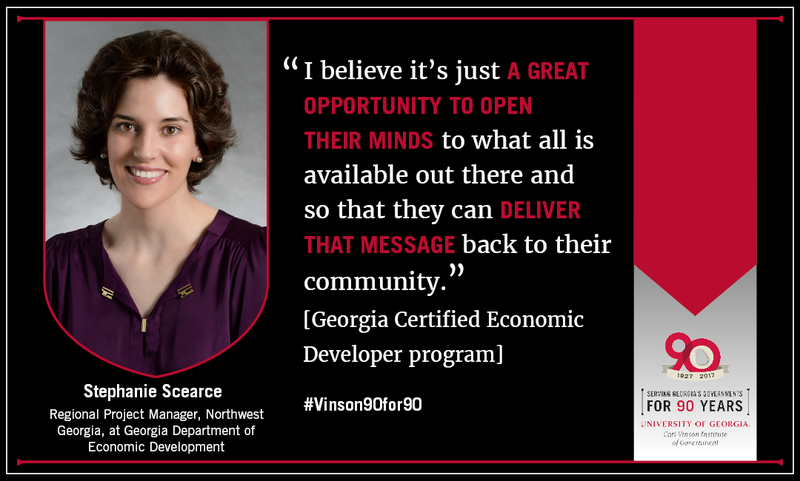 In what ways or types of project work has the University of Georgia's Carl Vinson Institute of Government served you and your government, agency or organization? Short-term (June 2016 – June 2017) visiting scholar through the International Center. 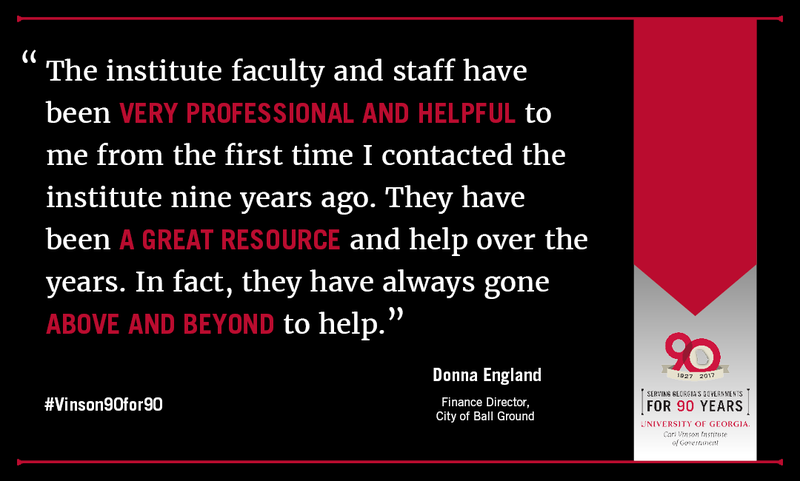 Please share any positive impressions made by the Institute faculty and staff on you and your government or organization. Over the past year of visiting, I have been so appreciate two program coordinators’ helping me: Fei Zhang and Hong Zeng. They helped me to conduct my research, connect with public officials, and draw on the resources of UGA. 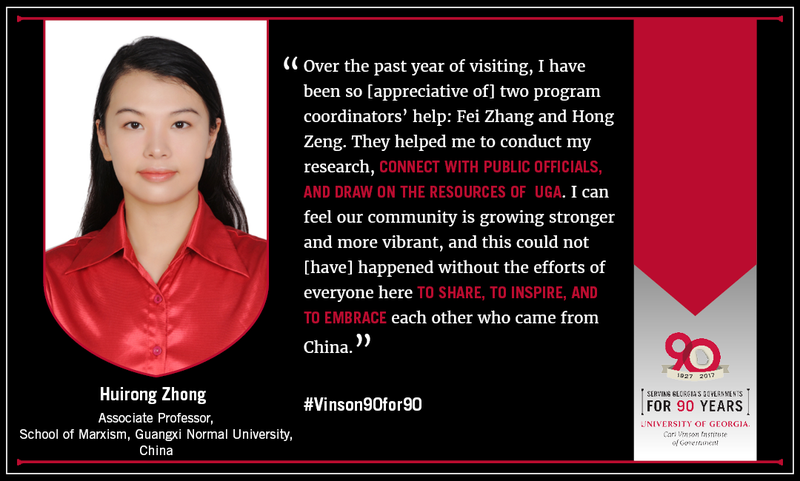 I can feel our community is growing stronger and more vibrant, and this could not happened without the efforts of everyone here to share, to inspire, and to embrace each other who came from China. What type of impact has the work of the Institute made on your government, agency or organization? What evidence can you share of positive change made as a result of the Institute’s work? 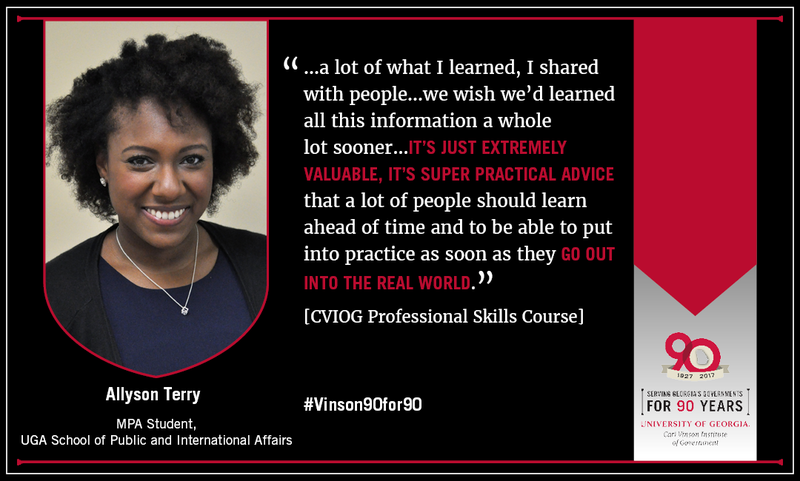 I think the most important [way] the UGA Carl Vinson Institute of Government served me is that the Institute cultivated the freedom of an open mind and helped my university to learn how to train officials and how to keep a long-term partnership with other countries. It was very timely. The Institute...really developed the practical side of the training so you really get the tools you need. It’s been a great journey. The classes have a whole lot of meaning on the practical level. 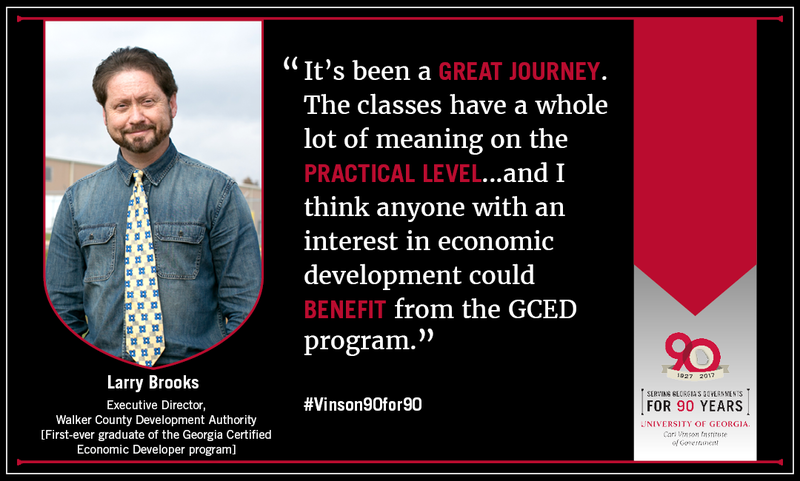 Jennifer’s [Nelson] done a wonderful job developing the curriculum, and I think anyone with an interest in economic development could benefit from the GCED program. The program happened to be immediately applicable for what we were doing. Audia is now looking at putting up another building. That means new investments, new jobs, new opportunities that are being developed for citizens. What the class did was open up my eyes to what could be done with the resources we had in hand. I think the greatest tool the classes provide is a very practical and real application that you can take back to the role you serve in. Jennifer does a great job bringing in professionals that don’t just stand and talk but provide real help and real assistance even if you need it outside of class.